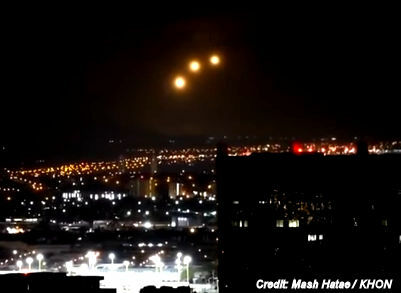 A strange sight in the sky over Oahu caught the attention of many people overnight. We received several messages via the Report It feature on our website from viewers who saw the lights. Mash Hatae says he woke up at around 2:30 a.m. Tuesday to get some water, and the lights in the sky caught his eye. In the video, you can see two bright lights, and then slowly a third light appears. Hatae says he saw about eight to 10 lights total. Another Flare Drop . . .
Well they are definitely not NORMAL flares IF they are flares. Flares go up and down. They don't hover in one place while they turn on and off.